100% recycled paper with a minimum of 30% post consumer waste. Embossed 2-pocket portfolio. Include die-cuts for business cards and diskettes. Assorted standard colors include: Yellow, Red, Dark Blue, Green, and Blue. An excellent addition of environmentally friendly school supplies to any household. 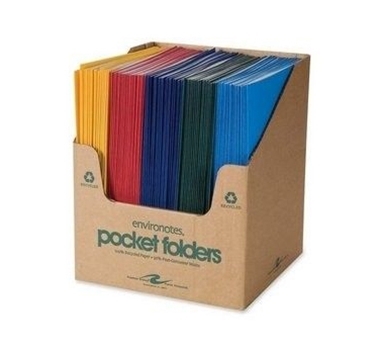 3 Folders per pack - come in random assorted colors. Please write us at orders@theultimategreenstore.com if particular colors desired.